Rose Coschignano/Pipe Dream Photographer Senior midfielder Rebecca Golderman scored two goals and recorded three assists in a loss to UMBC. 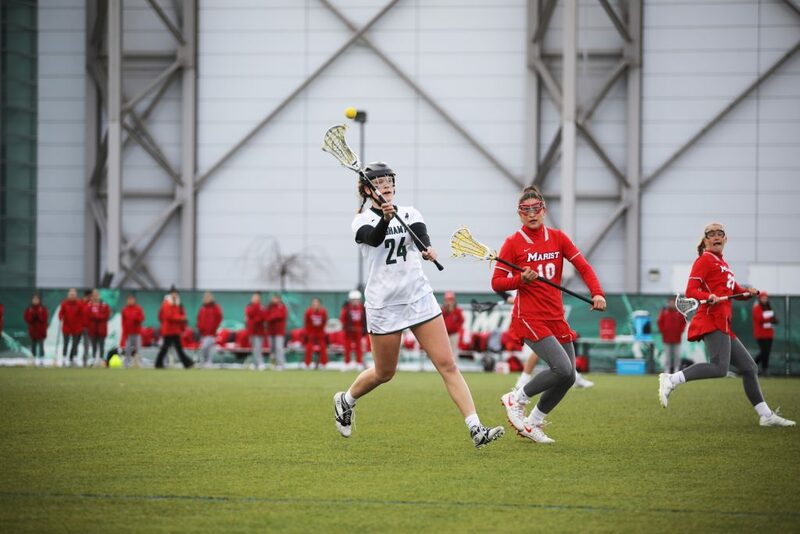 In search of its first win of the season, the Binghamton women’s lacrosse team had a 9-7 lead with just minutes remaining in a game against UMBC. At that point, the Retrievers and senior midfielder Catherine Sims took over the game, scoring two goals 11 seconds apart to tie the game and send the match into overtime. UMBC captured the initial draw control and took advantage with only seconds remaining on the shot clock, handing the Bearcats a crushing 10-9 defeat. Those critical moments have plagued the Bearcats (0-12, 0-3 America East) throughout the season. The team has competed well in the majority of its matchups but has struggled in high-pressure situations toward the end of games. The Retrievers (4-9, 2-1 America East) were able to take critical draw controls and score clutch goals in a come-from-behind victory. The lone possession in overtime, controlled by UMBC, was well played defensively by BU. The Retrievers were unable to get a shot off until just seconds remained on the shot clock when sophomore midfielder Julia Hatmaker scored on a laser pass from senior attacker Payton Van Kirk in the sudden-death overtime period. The struggles in the final minutes overshadowed what was a well-played game by the Bearcats up to that point. The Binghamton defense did not allow UMBC to take the lead throughout the entire second half, and four Bearcats recorded two goals, including junior midfielders Amelia Biancardi and Alissa Franze, as well as sophomore attacker Paige Volkmann. Senior midfielder Rebecca Golderman’s plays in this game and in the past three games have been notable bright spots for Binghamton. She recorded two goals and three assists against UMBC and has now scored in five straight games, including multi-goal efforts in the previous three. Golderman entered the season as the team’s presumptive leading scorer, and she has established herself in that role as of late. With the loss, the Bearcats have now matched their worst start in school history. The 2003 Binghamton women’s lacrosse team, in its second year of Division I play, finished the season with an 0-12 record. It is fair to say that the talent on this year’s roster is significantly stronger than that of the 2003 team, but Allen noted other factors that have contributed to the lack of victories thus far in the season. The Bearcats will continue to search for their first win of the season with a home matchup against UMass Lowell this Saturday, April 6. First draw is set for 1 p.m. from the Bearcats Sports Complex in Vestal, New York.